Darcy Cotterill, 30 and divorced, works days at the Nantucket library. She spends most of her nights stargazing in her backyard. She's just on the brink of starting a relationship with local carpenter Nash when unexpected new summer neighbors arrive: her ex-husband, his new wife, and his step-daughter. As Darcy is drawn into the lives of her neighbors, she develops a crush on another vacationer: Clive, a musicologist who is visiting his grandmother. Over the course of the summer, Darcy is driven to decide what she truly wants. Is she over her ex? Will she choose Nash or Clive? 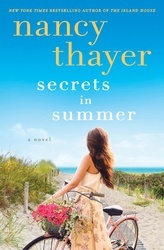 Before this unforgettable summer departs the shores of Nantucket, flirtations will flourish, family dramas will play out, and scandalous secrets will surface.